The team's athletic trainer called me at work about 3:30. I needed to get Colin to the emergency room as fast as possible. On the Tuesday after sectionals, what was initially thought to be a shin bruise, was now a dark purple, hot, swelling, gross mass, the size of a mango, or a small eggplant. And it was quickly spreading past the circle in indelible black marker the trainer drew on Colin's right leg with the time: 3:00 . I left work within minutes and got to the hospital an hour or so later. We waited a while with the other dozen or more patients, including the 8-year-old girl encouraged by her mother to practice her recorder in the ER waiting room. Anyone who has had a kid in elementary school has had to listen to the scales crucified on the beige, plastic, cheap flute. Every sick person cringed. No one had the nerve to be direct. But Colin asked the mother politely to have her child stop. "No one wants to hear that right now," he said. "It's beautiful, but everyone in here is sick." The little girl remained silent and a few others thanked Colin for his bravery. We were ushered in to an ER "room," and soon after the doctor saw Colin, who explained he was a wrestler, he was admitted for overnight intravenous antibiotics and observation. It turned out to be MRSA. It was very dangerous. In small amounts, MRSA is manageable. It's in your nostrils, it's on all the wrestling mats. Every sport battles with the contamination. Some sports more than others. Wrestling is one of them. The quick version is the doctors lanced the wound, it was extremely painful for Colin, in spite of the morphin and the local antisthetic shots. The doctors extracted about 10 cc's of yuck, and yes, Colin took a video on his phone. He just might show it to you if you ask. The best part is Coach Powell came to visit him. About 9 o'clock that night, after he had a long day of teaching and coaching. He had time for one of his wrestlers. "You have to get better, Colin, you're a key player." Colin didn't get better quickly. While he didn't qualify for individual state, he did not get to go with the team to Champaign, where his teammates, Chris and Nick Dardannes and Sammy Brooks, each won first place medals. Benny Brooks took third. Charlie Johnson and LaQuan Hightower were contenders. Colin had to keep his leg elevated with warm compresses. Sitting in the cramped stands for two days would make him even sicker. 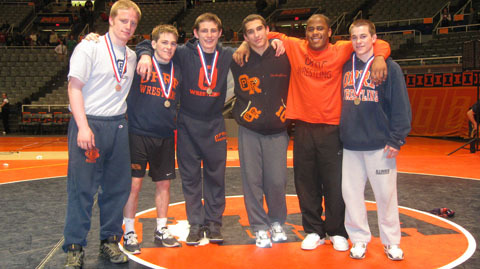 Colin missed wrestling in team sectionals on Tuesday, where Oak Park prevailed. He was hoping he could be well enough to wrestle at Team State in Bloomington this last Saturday. He wasn't, he could never have passed a skin test. By the time team state rolled around, it was scaling and still red. But he wrapped the wound and went to Team State on the bus with the team. We lost to Minooka. But Coach Powell talked to the boys, many of whom were extremely distraught. And like he always does, Coach Powell gave them perspective. I drove home with Brendan and Liam's mom, Danne. Brendan was on the phone with one of his teammates from the 2009 team. "What did Coach Powell say to the team?" "I didn't get to hear it," Brendan said. "But I bet it was really great." It was a very good year. I put the sheet cake I brought with me to Bloomington in the freezer. We won state last year and I bought a cake for that too. We ate it as champions. This year I was careful with the wording, not wanting to be arrogant, presumptive. 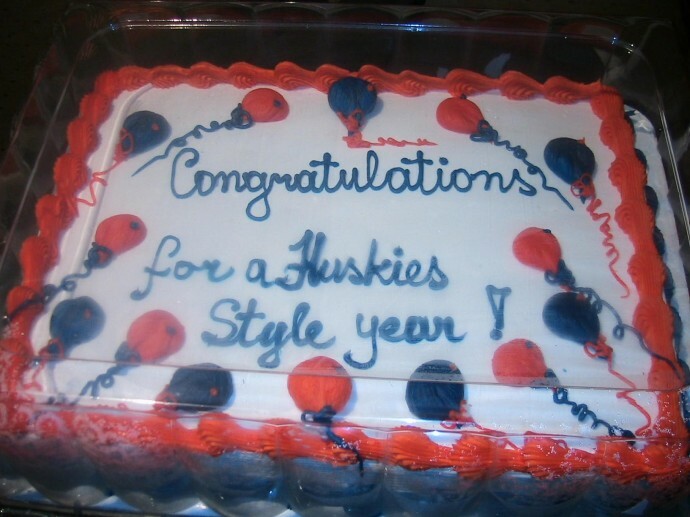 "Congratulations for a Huskies style year." The cake will stay in the freezer until the end of the year banquet where Powell acts like Powell and shows all of us why we belong to this wrestling family. It will be in a few weeks when all of us can look back with a little distance and completely agree on why this all means the world to all of us. Ouch. I just found your blog and subscribed. Nice to hear from other wrestling mom’s… that’s for sure. I have two boys wrestling in Minnesota and they are together on the varsity team. They took first in sections so will be headed to state this weekend. My youngest won the 9th grade state championship at 100 lbs and my oldest just took the regionals in the 135 wt. division and will go to state as an individual as well. It causes all sorts of anxiety for me! So far, we’ve had no injuries and I cringed when I read of Colin’s.